I grew up in Central Asia, where steamed dumplings were a highly revered dish, and were a fixing at almost any respectable get-together. They are called manti (aka manty) where I come from. However, tragically, although at that time very deliciously, they were exclusively made with ground (or chopped) animal flesh. As Hubby was introduced to the delicious smell of steaming manty, and the taste that lightly rested in his mouth, dripping its juices through his fingers onto the plate, it quickly became his favorite meal, and manti probably became one of very few foreign word he cared to remember, along with a few of his other favorite dishes: pirozhki, vareniki, pel’meni, persiki… 🙂 But enough of that, let me stop confusing all of you. Growing up, there were times when meat was not as abundant as it is here. Thankfully so! 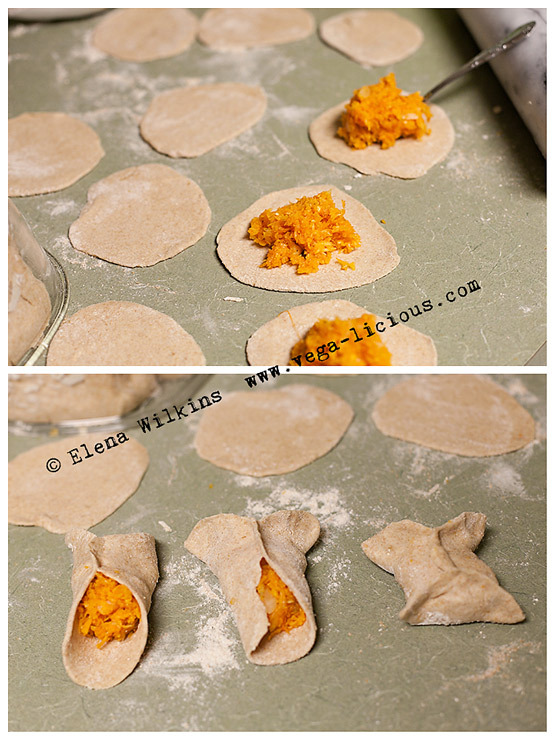 My Mom became very creative and made manti with pumpkin. At the time it was a second rated option for us, and little did I know that many years later it would become my favorite way to make this all-time favorite of ours. Thanks, Mom, for your creative wisdom! This recipe is a little more involved than most of the recipes you will find on Vegalicious, but it will be SOOO worth the effort! You will fall in love with it, and, if you master the craft of making it, you will WOW crowds with this gourmet specialty. Recommendations: If you are going to be entertaining a very picky crowd, I highly recommend using all white flour. You will introduce them to healthy plant foods, while still giving them something familiar and pretty looking. You can use all whole wheat flour, without mixing in white, if you wish for yourself, the dough, however, will come out a little bit more rough looking and tasting, that is the reason I mix in some unbleached white flour into mine. 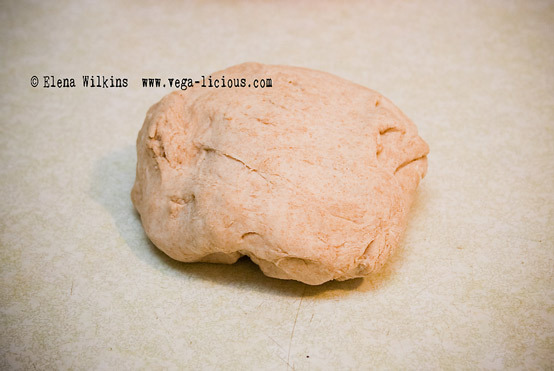 The dough is going to take the most of your effort, but kneading it is going to be great for your arm muscles :). If you do not feel like exercising, pawn the job off to a strong man in your household–I do it all the time :). In a bowl, combine 1.5 cup wheat flour, 1.5 cup white flour and add salt. Slowly start pouring in water, while mixing the dough with your hands. Make sure to incorporate all of the flour in the bowl. 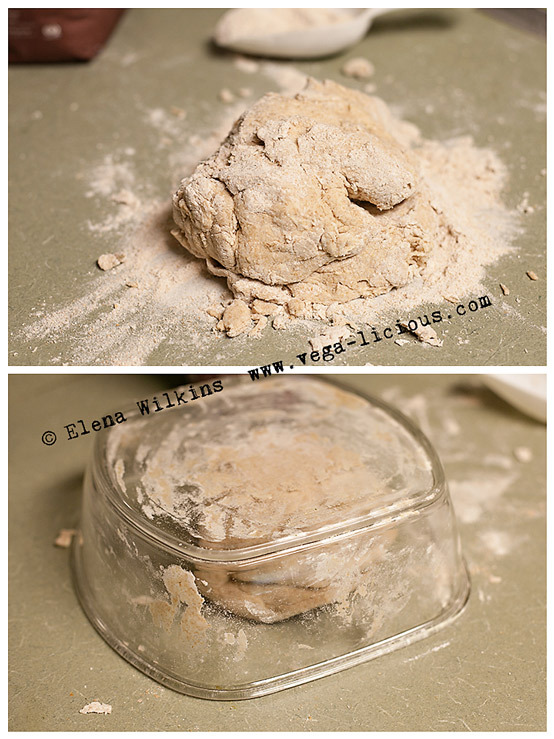 Using 1/2 cup of wheat flour, which you set aside, flour the surface and transfer the dough over it. Start kneading the dough. It will absorb the flour on the surface, so, you will keep adding more of the 1/2 cup and kneading, until it is all incorporated. If the dough is still too sticky, add more flour. Knead for 5-10 mins, until dough becomes firm and elastic, then place it under the bowl to rest, while you make the filling. 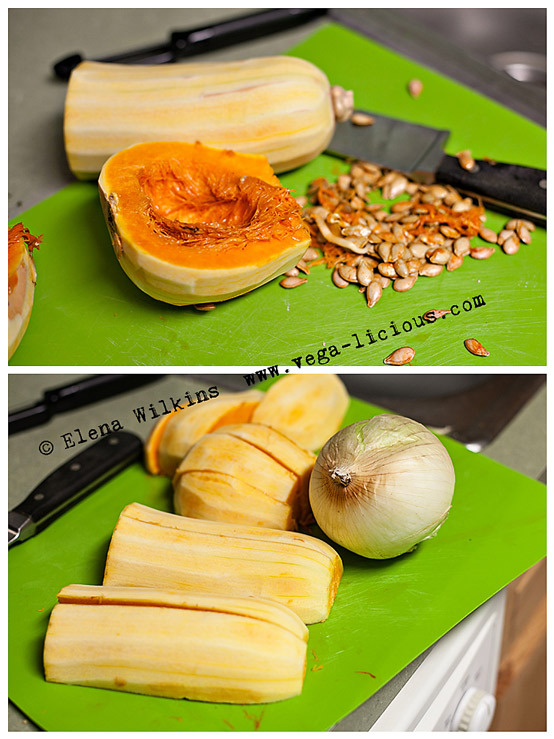 Peel butternut squash and cut open to take out seeds, then slice into manageable pieces (see below). Peel and cut onion in 4-6 parts (if you will use food processor; if you will use a grater, you do not need to cut it). 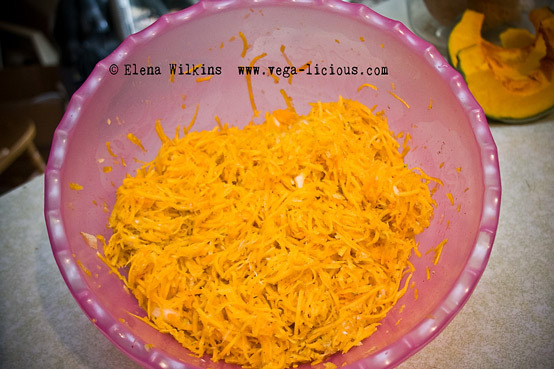 Grate both in a food processor or with a grater. If you do not want to grate onion by hand, you can dice it into smallest pieces possible. Add salt and spices and combine everything in a bowl. Divide dough into 4 equal parts and roll out each part (one by one, not all at the same time) into a long, sausage like line, which you will cut into 10-11 equal size parts (about 1.5 inch thick). Use 1/4 cup flour to flour the surface and dough, as you will roll it out into discs, that way it won’t stick to the surface. Take each cut piece of dough, turn it on the cut side, make sure there is flour on both sides, and using your thumb press it down to form a small circle (see below). Using a rolling pin, roll each disc into a circle. Make sure it is NOT too thin! You want it to hold the filling without tearing. I use a marble rolling pin, so, with enough pressure I roll over the dough one, then flip it over and roll it once again and I am done. Make sure that the dough and your fingers stay lightly floured. 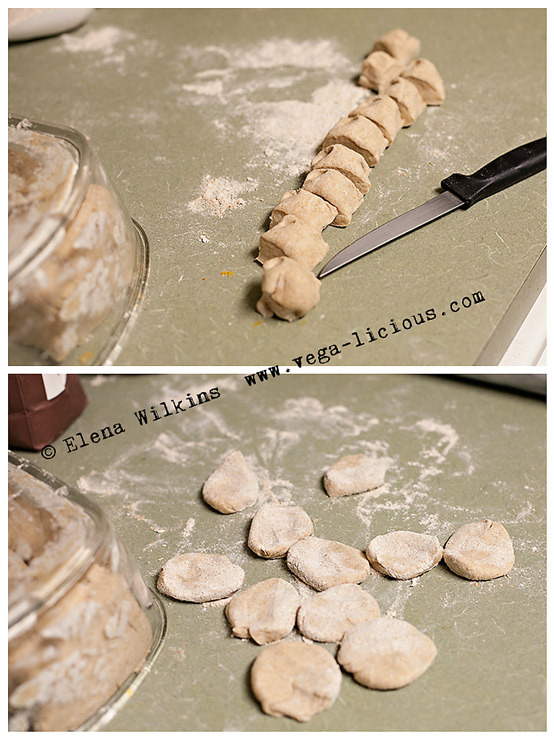 Place a heaping teaspoon of the filling (as seen below) in the middle of each circle. Normally squash and pumpkin do not yield too much juice, but if your mixture does, squeeze some of it off before placing on the dough. You want it moist, but not too wet, otherwise the dough won’t stick together. Cinch each circle in the middle (image below) and then on each side, shaping it into I shaped seams. 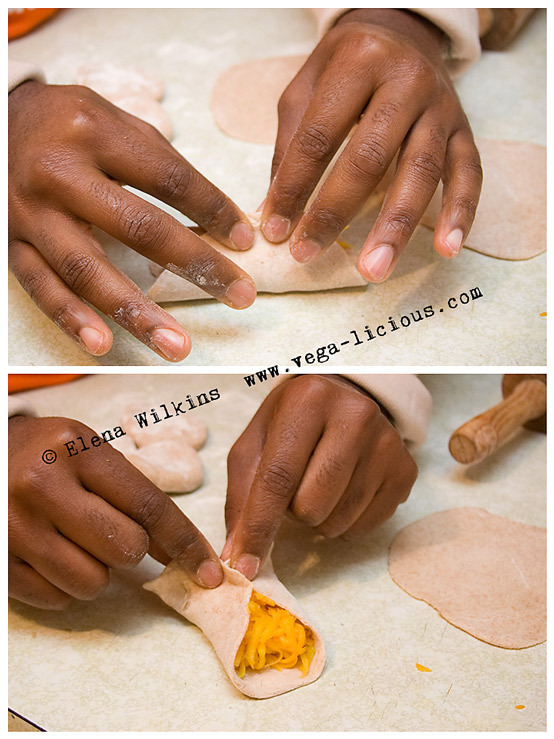 Following this method you will then grab the “ears” of each I, and pull them to the opposite side, sealing with your fingers and pressing dough together, so it sticks. You will end up with a very pretty looking dumpling. Be impressed with yourself! 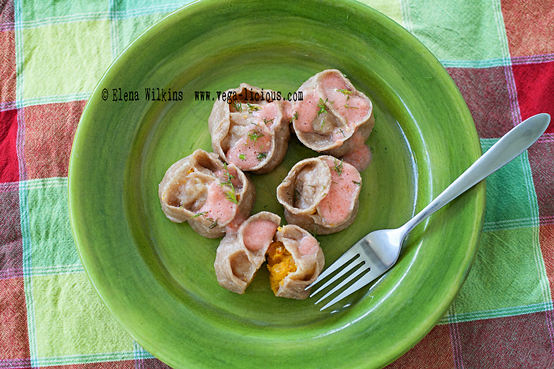 If the above version is a little too confusing and you are a beginner in the kitchen, you can still make rocking awesome steamed dumplings (manti), and they will still look awesome. 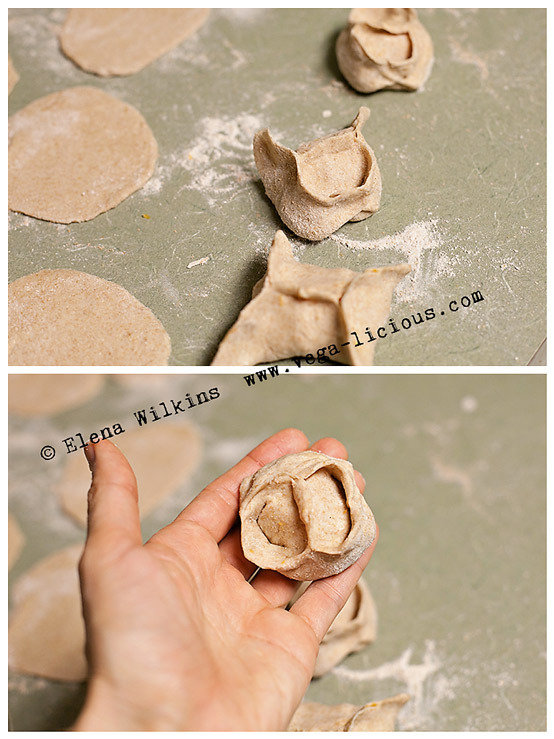 Simply hold one side of the dough in your left hand, with the right, keep pushing the rest of it up and in, cinching with your left hand’s thumb and index finger, until you form circular dumplings (see below). 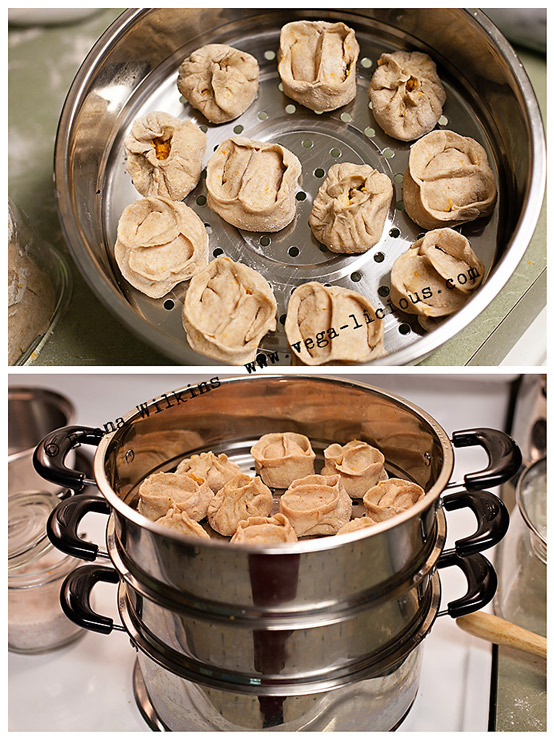 Once you oil each sheet, place dumplings on them–I have only two sheets in my steamer set, so I can steam only about 20-22 dumplings at a time. I freeze the rest (uncooked) to enjoy later–makes a quick meal. If you do the same, all you will need to do to cook them, is to oil the surface of the sheets, lay them out and cook, as instructed below, but for extra 5 minutes. 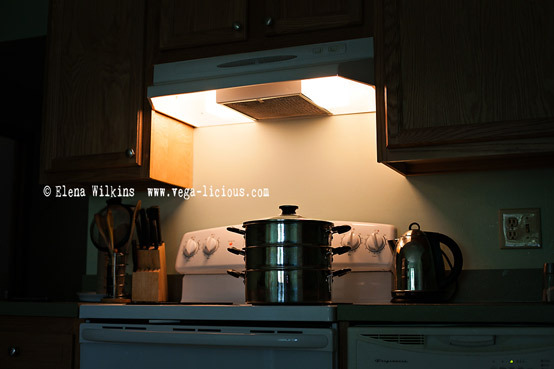 Fill the bottom pot 3/4 of the way with filtered water, cover and bring to boil. 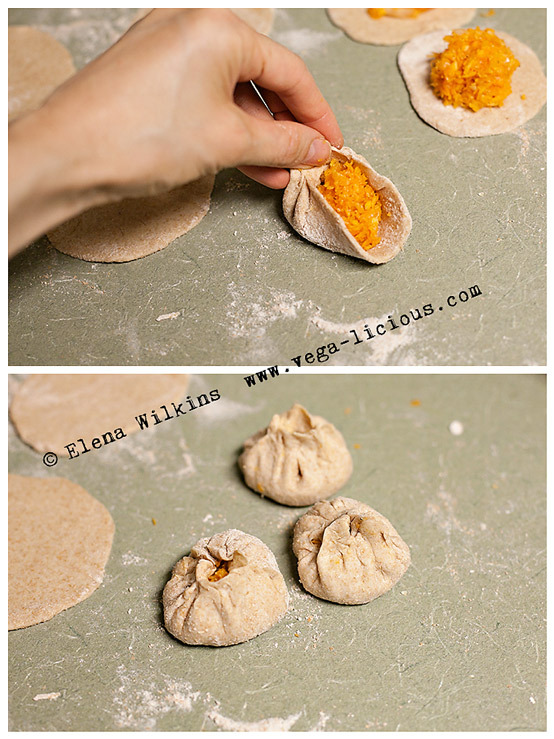 Place dumplings over it and reduce heat to medium. 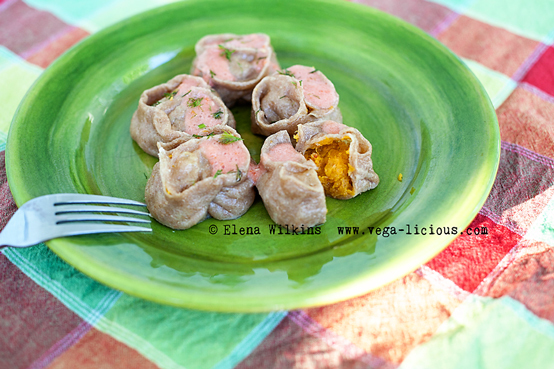 Steam manti for 25-30 minutes–taste one, the inside should be soft and cooked through. Meanwhile enjoy a cup of green smoothie and make sauce. Simply blend all ingredients, except for dill, in a blender. You will sprinkle dill on top of manti before serving. You will end up slurping a few of them down before you even know, they are that good! It is all about seasoning and the sauce. Do not be shy–they are very low in calories, so, enjoy as many as you like. If you end up eating one too many, go for a brisk walk around the neighborhood to work it off ;). Serve them while hot, and do not be afraid to use your fingers to pick ’em up and dip in sauce–that is how it is done in Central Asia. Serve along with your favorite salad. Enjoy! And do let me know if you make these. I love hearing from Vegalicious readers about their culinary adventures… especially with my recipes :).